Since 2013, URBED have been working with the Proud Trust to develop a new LGBT+ Centre in Manchester City Centre. The Proud Trust (formerly LGBT+ Youth North West) is a life-saving and life-enhancing organisation that helps LGBT+ young people to empower themselves and make a positive change for themselves and their communities. This is done through youth groups, peer support, managing the LGBT+ Centre for Manchester, delivering training and events, campaigns, undertaking research, and creating resources. Our work with the Proud Trust began in 2013 with a feasibility study for the refurbishment of the LGBT+ Centre on Sidney Street, which was the first entirely publicly-funded and purpose-built Gay Centre in Europe. 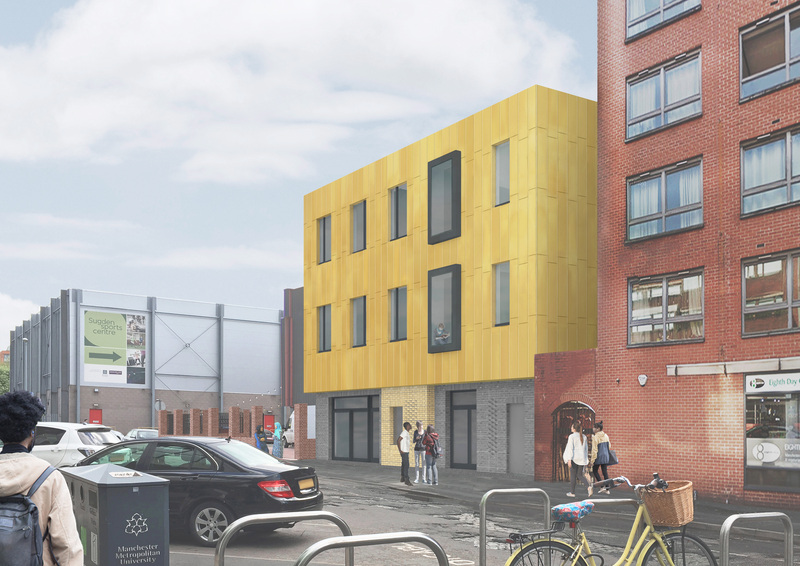 The project has since evolved into an ambitious proposal for a new three-storey building, to enable the Proud Trust to more than double its impact in supporting LGBT+ people and promoting equality and diversity, and secure its position as a vibrant hub of LGBT+ life for Manchester. Architecture is intrinsically a collaborative process, and many people and organisations have had an influence over the development of the project. This has included staff and user groups at the LGBT+ Centre, the Proud Trust, members of the public who attended the public consultations, URBED as the architect, LEDA as the building services engineer, Elliot Bond Consulting as the structural engineer, Modero as the quantity surveyor, and Dooley Associates as the project manager. A planning application for the LGBT+ Centre was submitted on the 26th November, and is pending approval by Manchester City Council. For more information please contact Ste Garlick at URBED. With appropriate timing, a planning application for the new LGBT+ Centre was submitted to Manchester City Council on the 26th November 2018, shortly after the Proud Trust’s 30 Years Queer event celebrating the 30th anniversary of the existing centre opening on Sidney Street. Individuals, organisations, or businesses who would like to support the Proud Trust in their life saving and life enhancing work with young people can find out more here or buy a brick for Manchester's New LGBT+ Centre. You can also keep up to date with the LGBT+ Centre on twitter at @LGBTCentreMcr. The planning application is now publically accessible on Manchester City Council’s website for viewing and commenting, and can be found here. You can also download a selection of the drawings and the design and access statement via the download links on the right. The Proud Trust recently hosted a celebration of the work done to date on the new centre. They have been successful in securing almost half of the money they need to rebuild the centre and provide facilities fit for the 21st Century, but there's still lots to do. We're really looking forward to working with them to develop designs for a special place for all the fantastic work they do. On Tuesday 15th May, the Proud Trust invited local residents, landlords, businesses, organisations, and members of the public to view proposals for the new LGBT+ Centre on Sidney Street. 50 people attended the three-hour drop-in session, with presentation boards being in place for a further week for various user groups and staff to view. Attendees were encouraged to provide feedback and comments via questionnaires, and a fantastic 34 responses were received. All responses will be considered during further design development work prior to the forthcoming planning application. The questionnaire results will also be published and publically accessible in the Design and Access Statement. To view the presentation boards displayed at the public consultation, please follow the link on the right. URBED recently facilitated a participatory design workshop with the Sidney Street Café staff in order to tailor the proposed kitchen to their specific needs. The workshop involved planning the kitchen at full-scale using templates of worktops and equipment. This was explored through discussions around kitchen workflows, training, servicing, and the presence of the counter and servery within the building. The discussions and agreed arrangement have since been incorporated in the design, and will be developed further following the forthcoming planning application. Following further design development of the LGBT+ Centre proposal, URBED and the Proud Trust recently organised a workshop with one of the user groups to discuss the updated design. Users were encouraged to discuss the revised plans and elevations, annotating and sticking emojis on the drawings and potential cladding samples in the process. These discussions led to changes in the materiality of the elevation. Gold cladding was a firm favourite of the user group, and gives a strong, loud, and proud presence, but with a neutrality that has been suggested by many consultation participants to avoid discouraging potential users or user groups. We have incorporated this in the upper levels of the facade. Additionally, various dark green and purple glazed brick finishes were received very positively during the session, and we have used these to emphasise the main entrance to the centre at ground floor level. Comments were also made on the proposed plans, and these have since been translated into several changes and additions to the proposal. The Proud Trust are currently seeking funding to build the new LGBT+ Centre. Please click here if you would like to help! Users commented on potential glazed brick cladding colours. Users commented on proposed plans. Proposed Sidney Street facade following the workshop. Thanks to everyone who attended last night's consultation event at the Centre. If you couldn't make it there is still time to take a look and comment on the proposals! Since 2013, The Proud Trust has been looking at their existing building and assessing different options for expanding the building. The design of the foundations makes it impossible to add additional floors to the existing centre. So the group has taken the decision to demolish and build a new centre. Last night we were pleased to show the proposals for a new centre. If you are interested please take a look at the boards in the download section. We are aiming to put in a planning application for the new building in January 2016 and need your help and support. Please fill in this survey to let us have your feedback on the design. We would like to invite you to come and take a look at the proposals for the new LGBT Centre. On 15th December we will be helping to explain the scheme at an event to display proposals for neighbours, users, staff and the public. Everyone is welcome to attend, you can drop in between 4.30 and 6.30pm. The proposals will then continue to be on display if you can't make it at that time. The scheme design has been developed following many discussions with the different user groups, young people who use the centre, the centre staff and volunteers. This will be a chance to talk with Emily, the architect working on the scheme, ahead of the plans going into planning. Please come along to view the plans and visuals of the new scheme and to provide much needed feedback on the designs. We are aiming to submit a planning application in January 2016. Any queries please email the centre manager: Ali Hanbury. The project has been quiet for a few months as the centre's staff have been in negotiations with the council regarding their lease and we have been compiling some technical information about the building and site. In September we held a short workshop with the Saturday youth group to get some ideas from the young people how they would like the building to look. We gave them loads of different images and asked them to pick ones they thought would be cool for the new building and ones which were uncool. They then stuck them up on the wall and we discussed the general themes. They thought a lot of the images were uncool! But they generally liked timber cladding and the use of some colour (but not too much!) on the facade. In March 2015 we held a briefing workshop with representatives of the user groups who rent and use the existing building. The workshop aimed to explore and test ideas for the building - what spaces it might contain, who might visit and how the centre might be usedin the future, as well as how it should feel as a place. Emily was interested to learn about the existing building and carried out some research about the history of the existing LGBT Centre, using the resources at Archives+. She presented this history as a walking tour as part of the first annual LGBT History Festival in Manchester on February 14th 2015. The 1 hour walking tour tells the story of how Manchester became the first place to build an entirely publicly funded, purpose designed centre for the gay community, just as Thatcher’s government were enacting Section 28. Feel free to download the guide and carry out the tour yourself (for non-commercial, educational purposes only). Yesterday we attended the Centre's User Group meeting and presented some initial thoughts about refurbishing and extending the building. The group gave really interesting feedback bout the layouts and design strategy. It was good to have the opportunity to speak with a variety of users from the different groups who use the centre. We are planning on visiting some existing Pupil Referral Units in Greater Manchester as well as some commercial kitchens to help inform the designs. LGBT Youth North West, the organisation who manage the LGBT Centre, have issued a press release about receiving the funding for their feasibility study. The story has been picked up by mainstream newspapers and tabloids. The strategic director, Amelia Lee, was also interviewed on Radio 4's today programme this morning. You can read of the LGBT Centre's official press release here. There will be a walking tour delivered in February as part of the LGBT History Festival on the history of the original centre's funding, design and construction centre, more details soon!